The snow is melting, and today I noticed my first spring bulbs sprouting tender new growth. I can't wait to see all the peach blooms that I laid to rest last autumn just off of my front porch. I'm also looking forward to all of the beautiful weddings that I already have on my schedule. I am two-thirds of the way to my sales goal for this year. If you are looking for wedding flowers in 2015, I encourage you to contact me soon, as my wedding season is filling quickly. I am looking forward to wrapping up consultation season, and to start working with my hands more. While planning her wedding, Jennifer spotted one of my funky succulent bouquets in Cincinnati Wedding Magazine, and she called me up. She knew she wanted flowers that were fun, but also appropriate for her Hilton Netherland Plaza wedding. Here is her beautiful bridal bouquet with tillandsias, succulents, peach anemones and ranunculus. Some of the centerpieces were low and full of succulents, peach anemones, roses and hydrangea. The rest of the centerpieces were tall clouds of baby’s breath. The beautiful lighting in the Pavillion Ballroom was done by Goodwin Lighting. How much do centerpieces cost? Shopping for wedding flowers is hard work, especially when it comes to comparing proposals. Because each florist has different sources for flowers and a different style, comparing quotes is like comparing apples and oranges. Are you going to get the right shade of pink? How big will the bouquet or centerpiece actually be? Sometimes you just don’t know what you’re going to get until it is delivered! My goal is to make each of my brides comfortable with the flowers I plan to deliver. I help brides select specific varieties of flowers based on their style, color palette and budget. Then I include pictures of each variety on their proposal, along with a written description and pricing. I even include approximate sizes for centerpieces. My hope is to surprise and delight my brides and their guests by creating a more beautiful experience then they imagined. But that also means “no surprises!” when it comes to color palette and size of their flowers. Color palette is something that must be tackled on an individual basis, but sizes can be easily compared. I created three classic blush centerpieces at different price points. Each centerpiece is photographed on a standard five foot round table with eight place settings. 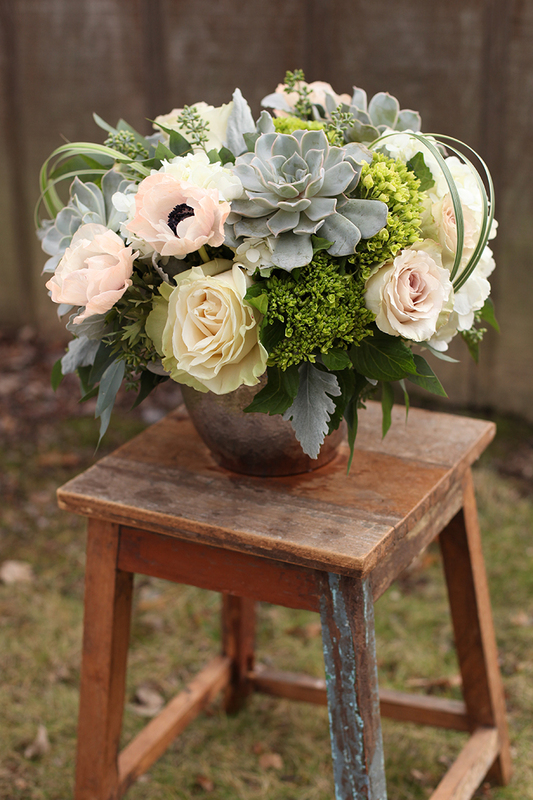 All of the centerpieces are made with the same components – soft pink spray roses, apricot stock, blush standard roses, white hydrangea and seeded eucalyptus. The first centerpiece is arranged in a gold compote, measures approximately 13 inches in diameter and retails for $85. Let’s call this the Small Garden Centerpiece. The Small Garden Centerpiece leaves room for more candles, favors or even a more formal place setting. It might be the right centerpiece for you if you are on a tight budget, or if flowers aren’t the most important element at your wedding. The second centerpiece uses all the same types of flowers as the Small Garden Centerpiece, but has 55% more blooms. It uses a higher quality footed metal bowl, measures 15 inches in diameter and retails for $130. Let’s call this our Standard Garden Centerpiece. It’s more full and lush than the previous centerpiece, but still leaves room for plenty of other elements on the table. The third centerpiece uses all the same types of flowers, but is in a larger footed metal bowl. It measures a generous 17 inches in diameter, and retails for $175. It has over twice as many blooms as the Small Garden Centerpiece. Let’s call this our Premium Garden Centerpiece. Notice how the Premium Garden Centerpiece really fills out the center of the table. This is for the bride who really values beautiful flowers, or the bride who wants a luxury feel for her reception. However, a bride that wants to get published nationally should consider spending twice this much. No kidding – I’ll talk about that more on another day. For kicks I added five peonies to the Premium Garden Centerpiece bring the price up to $235. They are smallish, and coming from the southern hemisphere this time of year. You could expect bigger peonies in June. But it goes to show that high-end and unusual blooms like amaryllis, peonies, dahlias, garden roses, calla lilies, orchids and succulents can add up quickly! I love expensive flowers just as much as any other girl, but they can do a number on the budget - a very large number. Size is important when it comes to centerpieces. All three sizes look beautiful on the five foot round table, but move up to a six foot round, and the Small Garden Centerpiece would look absolutely dwarfed! There are ways to fill larger tables with less product than the Premium Garden Centerpiece, but my “Small” for a six foot table would start out in the $130 range. Larger tables need more flowers. Proposals from different florists are going to be hard to compare. Just remember, you typically get what you pay for.